A cultivar of Camellia japonica L., ‘Rubra’, imported from China, has single, dark red flowers. [ICR, FC p.186/1835]. ‘In its native country, the Camellia rises to a height of from forty to fifty feet; but in Europe, it rarely exceeds from twenty to twentyfive, and forms a shrub of the most superb appearance, whose persisting foliage, of a glossy green, and splendid flowers, place it, without contradiction, in the first rank, among the plants of our green-houses. Its branches are numerous, alternate, diverging, reddish when young, but ash-coloured and striated in their adult age; the leaves uniformly alternate, large, smooth, generally more or less convex, thick, coriaceous, of a beautiful deep green, margins acutely, but not deeply dentated; the flowers, often from two to three inches in diameter, of a bright cherry-red, terminal, or rising from the axils of the leaves of the superior branches; they appear, in this climate, to gladden our sight, in November and March, when the frosts have desolated our gardens; this peculiarity, independently of the extreme beauty, so remarkable on this plant, has been sufficient to claim for it our preference; it may also be added, that if nature had not refused an agreeable aroma, it would be the sovereign of plants, to which no other could be compared, without disparagement.’ [Berlèse Monography p.14/1838]. 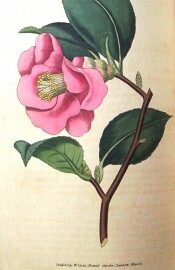 One of the earliest camellias to be imported into Europe. ‘The type from which nearly all our varieties are derived.’ [Berlèse Monography p.79/1838]. ‘This most beautiful tree, though long since figured and described […] was a stranger to our gardens in the time of Miller, or at least it is not noticed in the last edition of his Dictionary .’ [BM t.42/1788]. LBC no.397/1819. Listed in all published catalogues [T.259/1843]. It is probably ‘Rubra simplex’ that was received per ‘Sovereign’ February 1831 under the name ‘C. japonica rubra’. [MP A2948-2].